If you eat right, get plenty of exercise, and do your best to keep your stress levels low, you might think you’re pretty healthy. But then why do you feel so sluggish all the time? It’s possible that you’re suffering from obstructive sleep apnea in Calimesa. If you don’t address this disorder, it could turn out to be much more than an annoyance. It could kill you! Obstructive sleep apnea (OSA) is a disorder wherein the airway collapses during sleep, depriving a person of oxygen. Each period of non-breathing (called an apnea) can last for up to a minute. When the victim’s body goes into panic mode, the person comes out of slumber just long enough to take in much-needed air. The disorder makes it virtually impossible to get a night of high-quality rest. There is a cliché that goes with OSA, leading people to believe that the only folks with this disorder are obese men who snore a lot. That, however, is completely untrue. Anyone, even professional athletes who are otherwise in fantastic shape, can develop OSA. That’s why you should never let pride stop you from getting tested for this disorder if there is even the slightest chance that you have it. “So I’m tired,” you might reason, “what’s the big deal?” The big deal is that being deprived of quality rest for a long period of time can lead to serious health problems. Consider Tom Zehmisch as an example. Tom was a highly trained athlete who died of a heart attack before he turned 50. He was a loud snorer and likely had sleep apnea. Athletes who have sleep apnea are at a much higher risk of developing cardiovascular problems. Not getting quality sleep, combined with the stress of high-intensity exercise, can put far too much stress on the heart and lead to a heart attack. 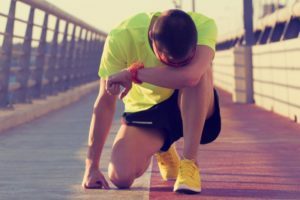 There are several theories behind why athletes may develop OSA, but the bottom line is that even the most fit people in our society are at risk of becoming victims of this potentially deadly condition. Should You Get Tested for Sleep Apnea? Fortunately, if you do get diagnosed with OSA, treatment is fairly simply. You may just need an oral appliance from your dentist to keep your airway open at night. Sleep apnea is a killer! We hope you protect your rest and your life by being aware of the signs of OSA and seeking treatment if necessary. Dr. Scott Parker is your friendly dentist in Calimesa. If you’ve recently been diagnosed with sleep apnea, he would love to help you start breathing easier at night with oral appliance therapy. To find out more about this treatment, please contact us at 909-795-6019.